We have created a PDF checklist for you to use as you watch the videos. Grab it HERE. 1 – Terminal / Buccaneer Way – On top of some shipping crates in the top middle area. 2 – Cypress Flats / Buccaneer Way to Cypress Flats / Popular St – Inside the train tunnel is a side are to the left with some wooden crates. 3 – El Burro Heights – In a metal building in a old trolley car shell. 4 – Pacific Ocean – On a small island on the east side beach. 5 – Vinewood Hills – On top of the “I” in the Vinewood sign. 6 – Rewood Lights Track – In the exact middle of the cement circular building in the northern portion of this unfinished race track. 7 – Grand Senora Desert – On the very top of the rock formation off the airport runway. 8 – Sandy Shores – In the empty pool behind the abandoned motel. 10 – Pacific Ocean – On a rock island off the power station area. 11 – Galilee – Under a porch area near the water. 12 – Grapeseed – Under the second from the north covered planting area. 13 – El Gordo Lighthouse – At the base of the lighthouse. 14 – Mount Chiliad – At the wood cabin restroom rest stop. 15 – Mount Chiliad – In a white tent in the hobo camp. 16 – Paleto Bay – In a side porch of this destroyed house. 17 – Paleto Bay / Procopio Dr – On the front deck of this seaside home. 18 – Mount Chiliad – At the top of the cable car with a parachute. 19 – Chiliad Mountain State Wilderness – At the top communication tower area of the cult camp. 20 – Mount Cliliad – On the north western side of this small peninsula. 21 – Fort Zancudo – In the marshlands below Fort Zancudo. 22 – Zancudo River – Under the drain pipe bridge. 23 – Great Chaparral – By the 3 crosses at the church. 24 – Grand Senora Desert – At the top of the cement plant. This is a WANTED area. 25 – Grand Senora Desert – Behind the billboard. 26 – Great Chaparral – In front of the mine entrance. 27 – Vinewood Hills – By the picnic tables at the juice stand. 28 – Vinewood Hills – In the pool house of this high-end home. 29 – Tongva Valley – Under a map billboard on the side of the road by a fruit stand. 30 – Pacific Bluffs – On the counter of the tiki bar at the pool. 31 – Pacific Bluffs – In the hedge maze. This place also has sweet rides to steal! 32 – Pacific Bluffs – On the small center island. 33 – Richards Majestic – Take a hard left and head to the north west corner and go up the stairs to the top. 34 – Pacific Ocean – At the end of the pier on the second floor of Pearls at the tables. 35 – San Andreas – At the empty skate pool on the beach. 36 – Los Santos International Airport – At the main lower section entrance. 37 – Los Santos International Airport – On the middle roof of the airport restaurant. Need helicopter. 38 – Davis – In the large dumpster outside of Mega Mall. 39 – Grove St – In the backyard of the one of these crap houses. 40 – Elysian Island – On the top of the tugboat. 41 – La Puerta / Palomino Ave – On the median under the bridge at the canal. 42 – Pillbox Hill – At the top top top top top top top top of the crane. 43 – Vespucci Blvd – At the south east tower of the bridge. 44 – East Vinewood – On the lower dam section opposite the city side. 45 – Vinewood Racetrack – On the bleachers, second row from the top. 46 – Hawick – On the halfpipe on top of the building. 47 – Alta – On the small wooden fenced in ditch at the construction site. 48 – West Vinewood – At the BBQ section in the back of this apartment complex. 49 – Raton Canyon – On a rock formation overlooking the river. 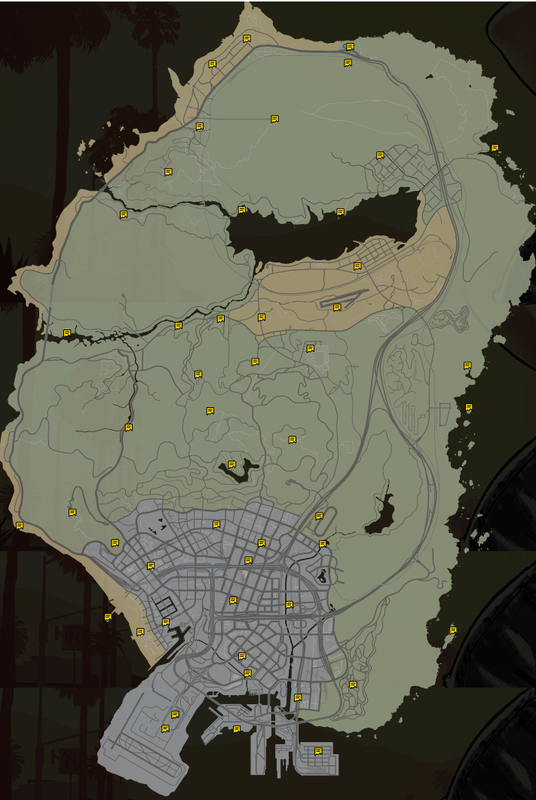 50 – Paleto Forest – In the woods across the street from the lumber yard. Posted in Grand Theft Auto V.
Thanks guys. Going to try to get videos for all of these pushed out today or at least most of it done today. Found one at the cable car station on top of the mountain. between where the 2 cars come to rest.